If Christians claim to trust God, why then do many of them worry? You might be just making ends meet, but all of a sudden, you had a major car repair. There is no more money in your bank account. What do you do? Maybe, you have just gone for an interview and you are anxious about the result. You pray, and you praise God for what had been done. Yet, the worries linger on. Will you get the job? Maybe you are a student, and your exam is tomorrow but you have only covered 50% of the material. How confident are you that you can make the grade? These are some examples of how the cares of this world can easily balloon themselves to be so big that our theology of God suddenly becomes so small. This question has often bugged me, and for this week, I want to spend some time on what it means to trust God, why we find it difficult to trust God, and what does it take to increase our walk of trust. 1) What "Trusting God" Means? I like the way Ps 46 begins with: God. Trusting God does not begin with putting our problems before God. It simply means whatever it is, whatever burdens or concerns we have, we turn our attention on the Creator, the Provider, the All-Sufficient God of the Universe. This focus on God is the most important first step for us. The reason why we have trouble trusting God is because we do not take seriously enough this Divine Refuge offered for us. God cannot force us to go to Him. We must humbly seek Him. 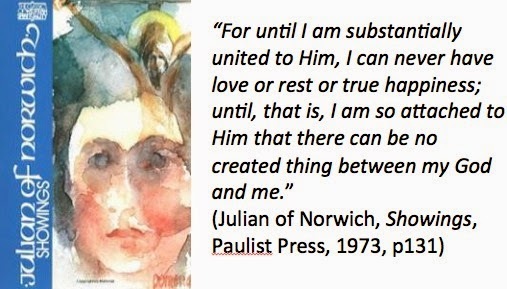 Just like the 14th Century English anchoress, Julian of Norwich who teaches us to rest in God. Julian had a vision of Christ who showed her a humble hazelnut with three truths. God made it. God loved it. God preserved it. When we take refuge in God, we become more aware of us being the hazelnut, that God has created us; God has loved us; and God will preserve us. 2) Why Is It So Difficult to Trust God? It is easy to trust God when things are going well for us. It is not so easy when the future is unknown, the plans are uncertain, and the resources are razor-thin, even non-existent. Allen P Ross, Professor of Old Testament and Hebrew at Beeson Divinity School calls this Psalm as demonstrating the "Powerful Presence of God." Martin Luther, the Great Reformer himself was inspired by this Psalm so much that out of his depth of awe and worship of God, came the majestic hymn: "A Mighty Fortress is Our God." The first enemy of trust is called fear. We live in a society where paranoia lurks in every conceivable place. There is the fear of being late. There is a fear of getting lost. There is that fear of being watched or losing our privacy. There is a fear of being hurt or getting killed in some freak accident. There is also that fear of death. Ps 46:2 speaks directly into this fear. Note how the psalmist speaks directly into the refusal to fear. He paints the extent of creation, the whole earth, the tallest mountains, the deepest seas, and the most powerful quakes, nothing is going to shake the security of the one who is hidden in God, our Refuge and Strength. The second reason is the failure to reside in God. Julian has a powerful insight on why we find it hard to trust God. It is because we fail to rest in God. Note how Julian uses the word "deliberately occupy themselves with earthly business." That is a mark of an earthly worrier. In filling their own space with everything earth, where is there room for heaven? Worse, there is a "deliberate" attempt instead of a humble willingness for God to help. Man tries to help himself so much that he trips himself. He who "constantly seeking worldly well-being" believes not in God but in his own prowess and skills. How can God be an ever Present Help in all kinds of trouble when one takes things into his own hands all the time and all the way? Like a bowl that is full of self, how can the bowl take on anything more? The third reason is simply this: They do not know God. Julian makes a distinction between those who know God and those who do not. The former who do not know God will never experience true rest. They will not know He is our Refuge, our Strength, and our present Help in trouble. When one does not know God, one will not be able to trust God. When one knows God, one will be able to trust God. The equation is simple. The more we know God, the better we can trust God. The less we know of God, the less trusting we become. That is why Allen P. Ross writes that Ps 46 is about "unconditional trust." The trouble with our lack of trust is simply because we have failed to fully know God. What does it mean to know God? 3) How to Know God? In wanting to grow in trust, we must grow to know God more and more. We cannot reverse it. We cannot say, "I trust God" and forget about who God is. We must remember who God is, before we can truly trust God. Dr J.I. Packer gives us four tips on how to grow in our knowledge of God. The four components are essential. The first two aspects deal with letting God speak to us, that we take refuge in God in wanting to know Him more. The next two deals with our response. Far too often, people become too impatient and want to get all the activity steps in place, and in the process forgetting to listen to God's Word. As a result, they fail to appreciate how Big, how Powerful, how Mighty, and how Wise and Loving God is. The moment that happens, one is at the mercy of the world's fear and temptations to deceive believers to worry, to fear, and to lose faith in God. In summary, how then do we trust God? We trust God simply by knowing God is bigger than all our problems. We trust God by not being distracted by the worries and concerns of the world, and to focus on the Person of Christ, like Julian, realizing that we are God's. God made us. God loved us, and God preserves us always. Finally, we trust God by knowing God. Take the time this Sabbath to reflect on trusting God by first knowing God.